A U.S. Army howitzer is trolling the world thanks to a Trump-related message one soldier stamped on the gun. 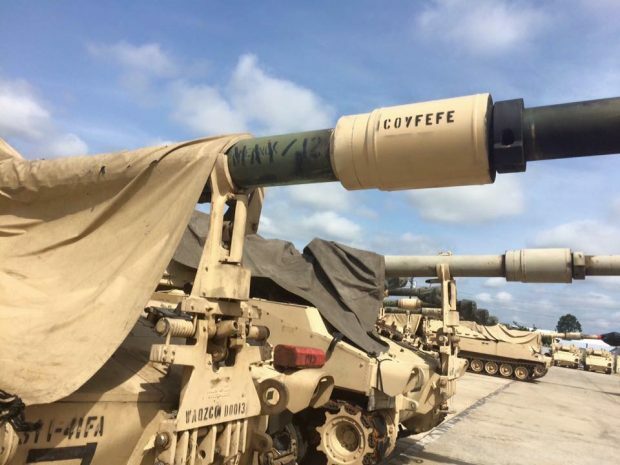 A photo provided to The Daily Caller shows the word “Covfefe’ stamped on the gun of an M109 Paladin. A source told TheDC that an individual made the stamp, not the U.S. Army. Most Twitter users joked about the typo, but some oddly suggested it might be secret message to the Russians. Trump supporters on Twitter started changing their names to “covfefe” to show solidarity with the president. Now, a service member with a sense of humor has gotten in on the action with the freshly painted howitzer. UPDATE (8:19 pm EDT): An earlier version of this article misidentified the M109 Paladin as a “tank.” It is a self propelled howitzer.